What Day Of The Week Is June 4? 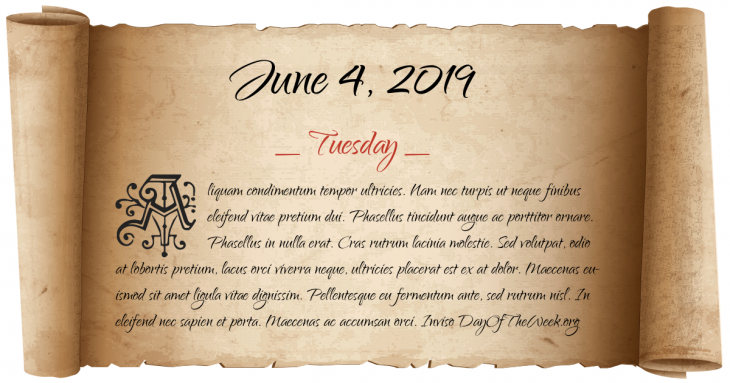 June 4, 2019 is the 155th day of the year 2019 in the Gregorian calendar. There are 210 days remaining until the end of the year. The day of the week is Tuesday. King Charles VI granted a monopoly for the ripening of Roquefort cheese to the people of Roquefort-sur-Soulzon as they had been doing for centuries. Captain George Vancouver claims Puget Sound for the Kingdom of Great Britain. Grieving over the death of his wife, Marie Clotilde of France, King Charles Emmanuel IV of Sardinia abdicates his throne in favor of his brother, Victor Emmanuel. Italian Independence wars: In the Battle of Magenta, the French army, under Louis-Napoleon, defeat the Austrian army. Hungary loses 71% of its territory and 63% of its population when the Treaty of Trianon is signed in Paris. World War II: A hunter-killer group of the United States Navy captures the German submarine U-505 – the first time a U.S. Navy vessel had captured an enemy vessel at sea since the 19th century. World War II: Rome falls to the Allies, the first Axis capital to fall. Tonga gains independence from the United Kingdom. A patent for the ATM is granted to Donald Wetzel, Tom Barnes and George Chastain. Ali Khamenei is elected the new Supreme Leader of Islamic republic of Iran by the Assembly of Experts after the death of Ayatollah Ruhollah Khomeini. Who were born on June 4?